just up the pike: what's up the pike: a picture's worth . . .
what's up the pike: a picture's worth . . .
- A daylong standoff between Montgomery County police and a man in a Wheaton apartment who was allegedly keeping his girlfriend hostage came to an end yesterday evening when officers knocked down the door to find the place was empty. 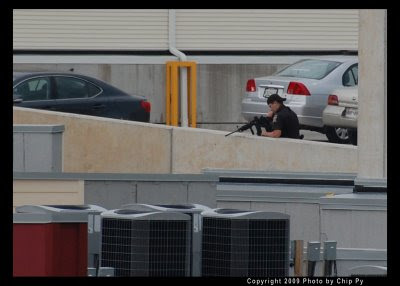 Friend of JUTP Chip Py sent us this photo of a sniper atop the parking garage of the Archstone Wheaton Station apartments at Georgia Avenue and Prichard Drive, a block from the Metro. The police "are now looking for the man and his hostage using what was described as 'Other Investigative Methods,'" Py wrote in an e-mail. - Speaking of photos: the Montgomery County Planning Department and Town of Kensington are co-sponsoring a "Day in the Life of Kensington" photo contest. Residents living within a specified area (larger than the town's half-square-mile official boundaries, but not including all of the Kensington zip code) are eligible to submit photos taken within the same zone. The contest deadline is September 15. Aspiring photogs who don't live in Kensington will hopefully get their own "Day in the Life . . ." contests as well. - Did anyone go to yesterday's Buy Local Silver Spring Block Party? (Twitter has been, uh, "tweeting" with comments about it.) What did you think of it? Leave a comment or shoot an e-mail to justupthepike at gmail dot com. - Like Thelonious Monk? The JUTP inbox received an e-mail saying that after a two-month run at the Blair Mansion theatre, the monologue Monk - featuring Rome Neal as the iconic jazz musician - will have its last performance today. When? I'm not quite sure. Call them up at 301/588-1688 for more information. - In the meantime, though: if you're near a radio around 12pm today, tune into the Kojo Nnamdi Show on WAMU 88.5 FM for a discussion about blogs with three awesome local bloggers and . . . me. If you're not near a radio, you can also listen online.